Master bathroom remodeling projects are at the top of a lot of people’s wish lists, and here’s a guide to help you make up your mind! Many folks tackle a master bath renovation and a master bedroom remodel at the same time, adding walk-in closets or dressing or sitting rooms, creating one peaceful, private retreat. There’s a school of thought that separate sinks can save marriages. Whether that’s true or not, having two sinks can make it much easier for a busy couple to get ready in the morning and get to bed peacefully. Depending on the square footage we have to work with, those two sinks could share a long vanity or sit on their own. Even if you’re a singleton who wants a master bath remodel, consider two sinks for the sake of resale value — you don’t want to discourage any potential buyers. 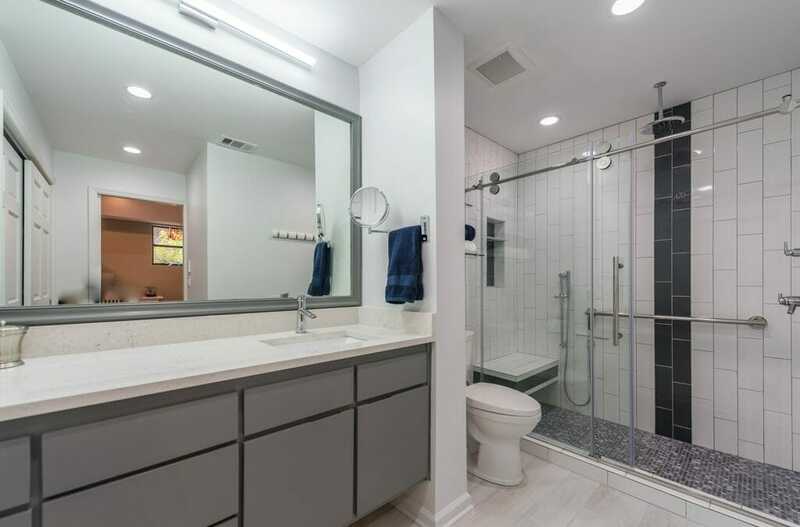 Ideally, the floor plan should leave enough space behind the sinks for another person to pass behind the one brushing their teeth or drying their hair without bumping into each other. Lighting is also a big consideration — especially anyone trying to put on makeup in the morning! Avoid harsh fluorescents and make sure it’s even, shadows don’t help anyone look good. For most adults, when we need to get clean, we head for the shower. In a master bath remodel, we’re seeing the free-standing shower area get larger, and is often partially or fully enclosed in glass, with niches to hold shampoos and soaps. A wall or ceiling mounted shower head (or more) is usually augmented by a hand-held head that can be mounted high enough to be its own shower head. The hand-hand version can more water for a more luxurious shower, and is also a real help when cleaning your shower! But the tub should not be overlooked if you like a nice relaxing soak. We’re seeing more people get rid of the built-in jetted tubs that were so popular in decades past. Instead, a deep freestanding soaking tub adds that five-star resort feeling to your home. The heated floors let you avoid getting all warm and comfy in the shower, then losing that glow the minute you set your toes on the cold tile floor in the winter. Heated towel bars are a little luxury that also dries your towels after you use them, so it’s practical too! And exhaust fans will vent steam and … whatever else you need vented, without rattling and humming and disturbing your Zen. Having a built-in linen closet in your new master bath makes life a lot more convenient. Having a walk-in closet makes life a lot more civilized and organized. If you’re looking for ideas or help in deciding how to remodel your master bathroom, we can help — give us a call!